I harvested this honey today out of my brown hive. I didn’t really mean to do that, but it was clearly needed. I went to check out top bar hive at my house today. The bees have been really busy and I gave them 4 more bars to build comb on a few weeks ago. But when I looked though the window it seemed that the comb was crooked! Top bar bee keepers have warned me of this. Apparently once the bees start building their comb out of line it will just go on like that, eventually creating comb that spans two bars and then gets very messy to move. Well, it seems like I waited too long, as there were about six combs that bulged over at the top toward the next bar, one of them even attached to the next bar. So there I was with my hands in the hive and this mess unfolding before me. It seems like all the crossed over comb was filled with fresh nectar, so at least I wasn’t disturbing the brood, and most of the problem was up high and on one end. I wish I had pictures, but my helpers were all elsewhere and my hands and head way to busy to think of that. Matt Reed, who built my hive, had said “you just push the comb back where it belongs”. I tried that, and it served to get honey all over my gloves and the hive. The bees frantically rushed about slurping up the spilled goods. So I got a kitchen knife and cut the big chunks of offending comb off and then used the big knife to push the rest of it back into place. I sure hope that works. The bees were very upset with me. Single bees kept breaking away from the rest and attacking me. I watched one sting my shirt and another my glove. Only one got through on the right side of my chest. Perhaps that will invigorate my shoulder in its healing. But it’s making me consider getting a smoker. So far I’ve just used sugar water in a spray bottle, but this wild swarm of bees is feisty. 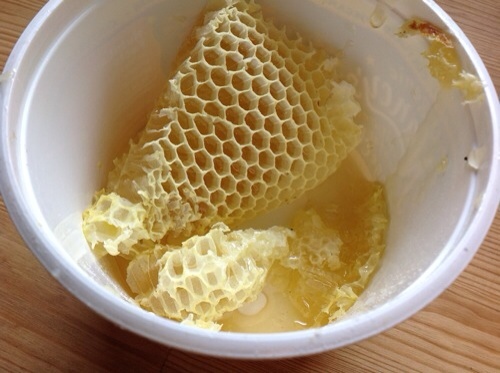 In any case, I have heard that honey comb tends to be a bit wider than brood comb and it looks like that is where the problem sprung from. So I started the process of making a slightly wider spaces between the bars when pushing all the bars back into place. But the bees were so stirred up that I never got to the last bar. Eventually I just closed the lid and walked away. Hence I am sitting inside writing this post and eating the delicious honey. It is slightly minty, perhaps lemon balm flowers? It’s not cured yet so it won’t keep, but I’m straining it out through these jars to put in my tea for the next few days. If I don’t eat it all first. These are two mason jars with a screen in between and the crushed wax on top. 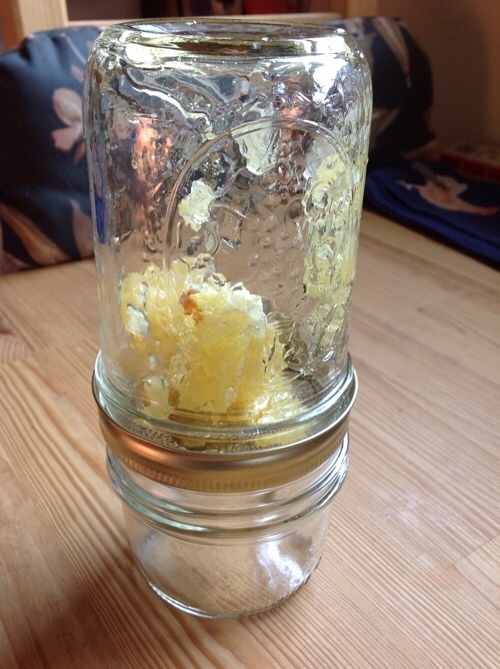 The honey is supposed to end up at the bottom after a few hours. We’ll see how patient I am today. I’ll have to go back outside and finish up putting the hive back together sometime soon. I have to admit, I’m a little scared. I tried to sit a few feet away and watch them and someone kept coming out and buzzing at me. We’ll see, maybe they’ve settled down by now.